Filtered Coffee tastes best when it is made using freshly ground beans – exactly the way that WMF1200F does it! The perfect cup or larger volumes of filtered coffee can be prepared at high-speed: 0.5 litres of freshly ground and filtered coffee can be brewed in just 65 seconds. Thus filling up a large mug or thermal jug is just a matter of moments. Furthermore the optional quantity brewing arm allows dispensing of coffee into large insulated jugs. Whether it is used as additional equipment for a WMF specialty machine, to make coffee for breakfast or to provide coffee for large meetings and many guests, the WMF1200F ensures the outstanding coffee experience. 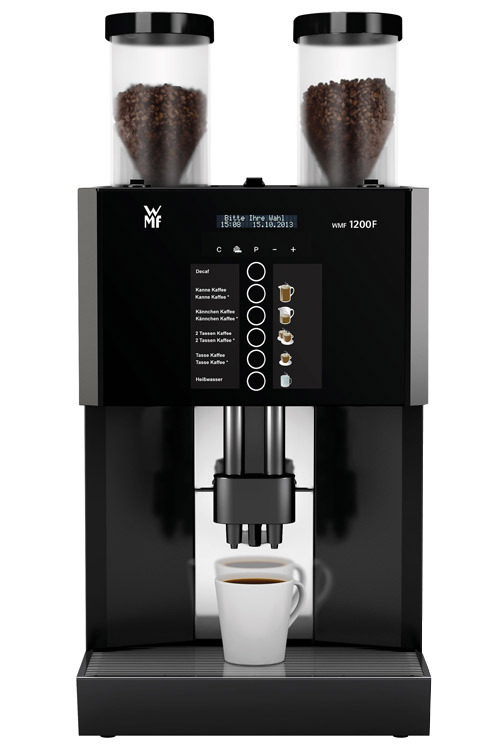 For large volumes at high speed the WMF1200F has been specifically designed with a brewing unit with double capacity. The brewing unit can be easily removed for maintenance and cleaning. With its narrow width of 330mm, the WMF1200F doesn’t take up much space and can be used as accessory or beside other coffee machines like its visual counterpart the WMF1200S. Larger volumes of 0.5 and 1 litre can be dispensed by using the optional side brewing arm. It is possible to fill jugs of up to 170mm in diameter and 395mm in height. The hot water spout is located in the centre of the WMF1200F and is operated with a simple touch of a button on the display. Up to six beverage buttons can be assigned with the WMF1200F, for example cups, jugs or coffee mugs. The simple labelling of beverage names, images or prices can be made manually exchanged easily and quickly. The five centrally positioned keys can be used to make all setting for the perfect quality coffee. For example, by selecting the plus or the minus symbol, you can make each individual beverage strong or mild, large or small. The WMF1200F includes an automatic switch-off time and a so called Eco-Mode. This means you can reduce the energy consumption of coffee-making during reduced workloads. Insert a cleaning tablet through the manual insert and via the display, start the fully automatic cleaning of all the components that have come into contact with the coffee. The central coffee ground container of the WMF1200F is easily accessible. Alternatively you can also dispose of your coffee ground via the bar. With the optional 10cm high base stands, the scaffolding of the WMF1200F can be raised, allowing effortless cleaning of the space below the coffee machine.